I'm using it for Dillmans Grove, and it's called Bramble Cottage. This month I'd like to see it decorated! You can decorate it in any style - and feel free to change some of the internal walls, but please keep the spirit of the place. 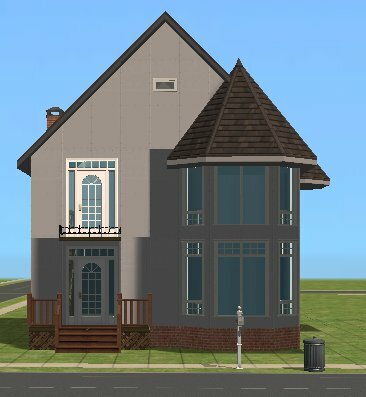 The doors need to be placed, and feel free to swap out the windows for any other style you like. Ooh a decorating challange. Niiiice. I've made the dining room octagonal and a servery window from the kitchen to the dining. Not completely finished with upstairs layout as yet. Bathroom issues abound. That is so cute, kiri. Way cuter than anything I'd come up with. Hmmm, bathroom ideas? 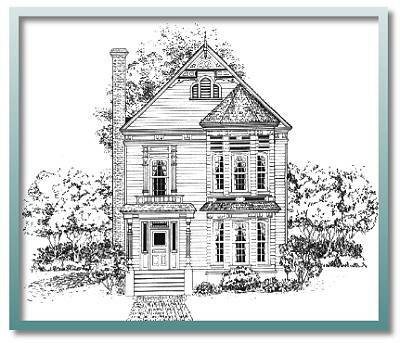 Maybe you could do a separate tub and shower, like to sort of match the age of the house. Make it... luxurious in a sort of modest way. The first Bathroom issue is where to put it - It's the door issue upstairs with the 4 back rooms. 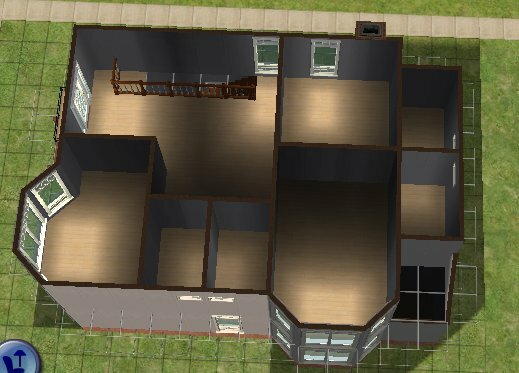 Well you could keep the 2 small bathrooms at the back there but they'd only be accessible by walking through the bedrooms which isn't great. 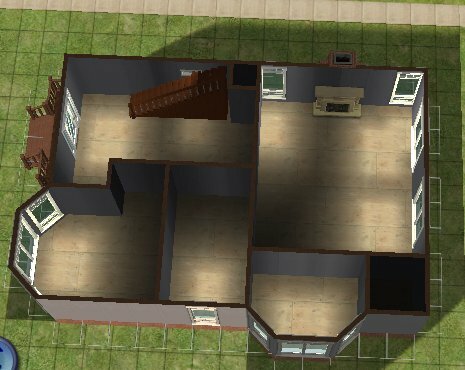 Or you could convert one of the bedrooms into a bathroom, and either make those small rooms closets or knock down the walls and give more space to the bedrooms/new bathroom. I would choose the latter if the family didn't need all 4 bedrooms. Could maybe even divide one bedroom into 2 bathrooms. The house was owned by a travelling sim ( a sea captain or somethiing like that) and there are small souvenirs from their time abroad. The house is currently owned by the sea-captains daughter - the house is a bit old fashioned, but liveable. There is a mini-flat upstairs for the loyal family retainer who has taken care of the house while the daughter was at college. All is playtested, the only pathing issue is the koi pond watch interaction and it needs a plant mod. CC used (TONS) : Holy simoly walls, holy simoly curtains, curtain recolors by shastakiss, windows and blue recolor by me, arts and crafts bits by me, onetile door by me, freetime nectar bar by someone, column by someone, white fence by someone, numenors recolorable stairs, honeywells bigger bushes, couple of poster recolors by me, fence by me, gate by me. Absolutely gorgeous, lee, I love it! That's just perfect Lee! I love it. I love the back-story too. My favourite is the garden - because I love the way you've used the shrubs to give a realistic looking shape - and with the ivy it works really well. Of course - I love the Kitchen as well - it looks very old century, especially with the stone floor! The front room for the butler - excellent idea I never thought of that one!